Heating a large room can be difficult and expensive, especially if you choose the wrong heater. Finding the most efficient solution for your heating needs will ensure that you gain that cozy homely feel without breaking the bank. Here is a little insight into how to choose the right heater for you, along with a few of the best models on the market. Auto shot off timer, tip over protection and overheat protection. 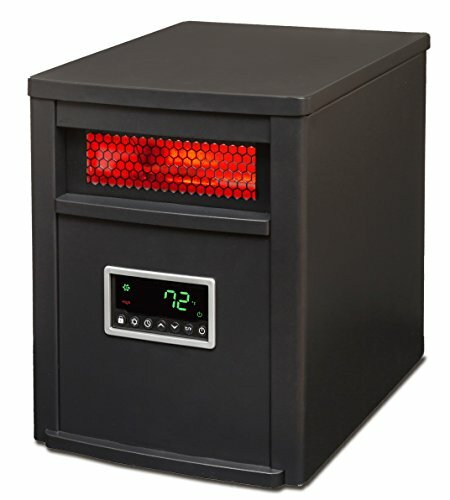 The best overall heater for large rooms. You will not be disappointed with this efficient and effective heater. There are three main types of heaters when it comes to heating a large room: radiant, convection, and combination heaters. Radiant heaters, powered by electricity or fuel, gas, kerosene, etc., work in the same way as the sun, by radiating heat outwards. Some of these are infrared models. These heaters work by being pointed in the direction to heat, and some have reflectors to conduct heat to specific directions. These types of heaters work best to warm objects rather than whole spaces. Convection heaters work by creating air circulation, relying on the natural flow of hot air rising. As air rises out of the heater, it creates a vacuum for cold air to be sucked in. This makes air circulate naturally as warm air flows into the vacuum of cold air. These type of heaters are designed to heat the entire room because they heat the air rather than specific objects. Some heaters, such as ceramic radiant heaters, are a combination of both as they use a fan to circulate the heat that gets produced. 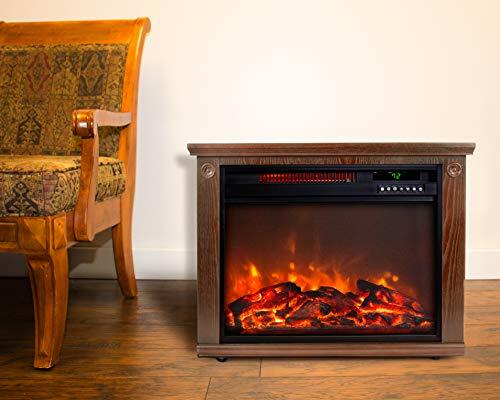 You will also find four main designs of heaters: wall, baseboard, freestanding, and electric fireplace heaters. Each is aesthetically different and circulates heat differently. The major consideration is the space that you have for it and the way you would like the heat to rise. The first and most important consideration is power. If you want to heat a whole room, you need to measure its size. In general, 10 watts will heat 1 square foot of space, so you will need to find a heater that has the capacity to heat the size of space you are considering. Secondly, see what you have available and the utility of the heater, so you consider your fuel options. Those with small children may find a propane tank heater a little dangerous. Equally, if you do not have gas lines installed in your house, a gas heater may be out of the question due to the high installation costs and disturbance. Electric heaters tend to be cheaper upfront. That said, gas heaters tend to be cheaper to run than electricity and could be a better option if they fit your criteria. Think about the space you have to put a heater. Are you looking to recess something into the wall or to have an aesthetically pleasing fireplace? Alternatively, you may be looking to have a surface wall heater that you can tilt for workshops and garages. Perhaps a free-standing heater is more suitable for portability so you can move it from room to room. Understanding the design will help you narrow down your choices. You can also consider some of the other added features such as a built-in thermostat, adjustable fan, cool-touch exterior, automatic tip-over, overheat switch-off, remote control, timer, and wheels. All these features help with portability, safety, or convenience. When installing a heater, safety is important, therefore, identifying the features of a large room heater is integral. First, you want to ensure it has been tested for safety. 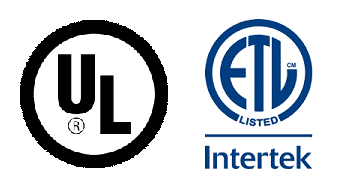 Look for a label from a recognized testing lab such as UL (Underwriters Laboratory), ETL (Intertek), or CSA (Canadian Standards Association).will verify the safety of the model. Next, consider the safety features that come with the heater. The Cool-touch exterior will stop the outside of the heater from getting hot and posing a fire risk. Some heaters feature an automatic switch-off function when the heater starts to overheat. Moreover, you will find that some heaters will automatically turn off if the heater tips over. You can find another great and often forgotten safety feature on gas heaters. It is a carbon monoxide-related feature that switches the heater off when there is not enough oxygen for combustion. It prevents carbon monoxide from being formed. When using a gas heater in your home, always make sure to have a vented combustion heater; unvented heaters can be very dangerous. Remember what to consider before selecting a heater for a large room. Here are some of the best models available on the market today. With both tip-over and overheat protection, this model features a dual heating system using infrared and PTC. It has 1500 watts of power and ranges from temperatures of 122-250F. It has a high-efficiency blower but operates at only 39 decibels. It has wheels for easy portability. The blower is both efficient and quiet. It contains technology that does not dry the air out. It has tip-over and over-heat protection as well as being cool-to-touch and having a 12-hour automatic shut-off, making it very safe. This heater can heat up to 250F at 3.5 meters per second, meaning it can produce 60% more heat than other heaters with the same wattage. The grate on the front of the heater gets very hot to touch. This model uses a lot of electricity so can be quite expensive to run. This heater operates quickly and has the capacity to warm large spaces. However, it is a little costly to run, and despite the plethora of safety features, the grate has a flaw, making it hazardous for children and pets. It is a whole-room oil-filled radiant heater. It has 1500 watts of power and three heat settings. It has a remote control for convenience and a digital display and features wheels for portability. The timer settings make it very convenient. It is easy to put together and very simple to use. This heater is extremely quiet when it’s operating. The eco mode saves a lot of energy but provides a significant amount of heat. It can easily be moved from place to place depending on the room that needs heating. The sound of the digital display is very loud. The angles on the remote control are not very good, so you often have to move to make it function. 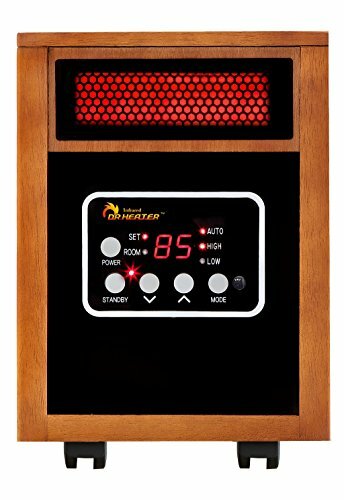 This radiant heater is a good option for those looking for a portable model with convenient timer settings and quiet operation. This wall-mounted 4000-watt heater can heat up to 600 square feet. It comes with a wall can, grill, and thermostat for easy installation. It has an automatic overheat function and a fan to dissipate the heat. It can heat up to 250 square meters in less than 5 minutes. 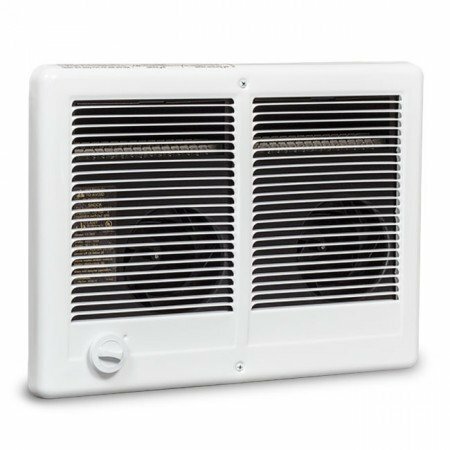 This model is designed to heat very large spaces and has the wattage to cover this effectively. The thermostat isn’t as precise as it could be. If you want to install an external thermostat, the internal one is hard to bypass. It is a very powerful wall mounted heater that’s easy to install and that heats a room quickly. If you’re looking to have your own thermostat, this model might not be the most appropriate. 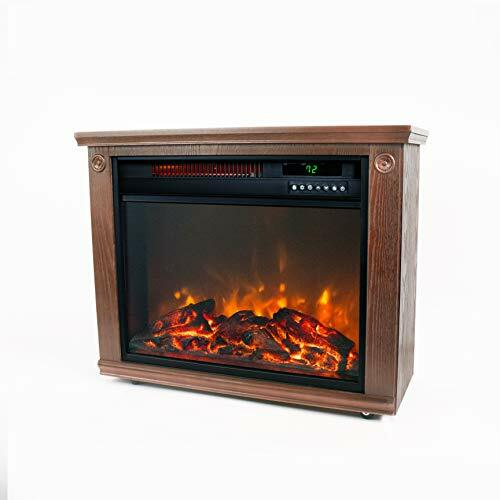 Aesthetically designed to mimic a log fireplace, this electric heater has 2 levels of fire glow and produces heat using infrared. It heats 1000 square meters and has a beautiful oak framing and mantlepiece. It has three heat settings, including an eco mode, and a 12-hour timer. You can use the flames whether the heater is on or not. Infrared technology does not dehydrate the air. The flames are very realistic, creating a cozy feel. It is very energy efficient, heating up to 1000 square meters, using only 1500 watts. Despite being quite large, this model is portable and can, therefore, be used for zonal heating. The fan is extremely loud. There is no automatic shut off if it overheats. It is a very beautiful supplement to the home, with a realistic fireplace touch. Aside from the loud fan, this model fits into any room nicely, and you can move it around. With an adjustable, programmable thermostat, and an oscillating design, this model is made to create even heat distribution throughout a room. It has a cool-touch exterior and 1500 watts of power. It’s very quiet and can, therefore, you can use it in the bedroom. The cool-touch exterior makes it a safe choice for children and pets. It is very durable and doesn’t seem to crack if accidentally knocked over. Despite being small in size, it puts out a lot of heat and can warm a room very quickly. The thermometer is not very accurate. The ‘auto’ setting uses the highest amount of power. It is a great model for people with children or pets as it is cool-to-touch and can take a knock. It heats rooms quickly but isn’t always the most accurate. Finding a heater to warm large rooms, such as basements, can be a chore. The best way to go about it is to understand your needs in terms of shape, size, style, and power. That way you’ll understand which model you want. Just remember that your lifestyle will dictate the heater you choose, so consider everything before.